Start recovering from the effects of vandalism or violence today with crime scene cleanup and trauma repair services from Flood Fire Pro. Our cleaning technicians are available 24 hours to start cleaning up the physical effects and help you begin healing. Don’t assume you can use a routine cleaning company in these cases. Many deadly communicable diseases are transmitted through blood and body fluids. 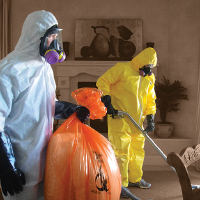 Unless a cleaner specializes in hazardous waste removal, a company that is experienced in blood-borne pathogens must be used. Our technicians have been inoculated against the Hepatitis B virus for their safety. They also have Institute of Inspection, Cleaning, and Restoration Certification (IICRC). They will safely control and eradicate odor, clean up biohazards, and remove contaminated debris from all crime scene cleanup issues. We are discreet and professional in what we do. The circumstances of your trauma will never leave our company. Each scene is confidential. Our technicians are caring and compassionate individuals who use the utmost professionalism on every job. We will help with the paperwork for reimbursement from the insurance company when applicable. That way we can take a little more of the stress off of you and your family. Contact Flood Fire Pro Inc. today at 800-446-3776 for all of your North Attleboro MA and Greater Providence Rhode Island MA crime scene cleanup disaster and restoration needs.